From Calvin Klein comes the Double Waistband Swim Shorts in Electric Blue Lemonade colour, featuring branded drawstrings and printed branding on the left leg. 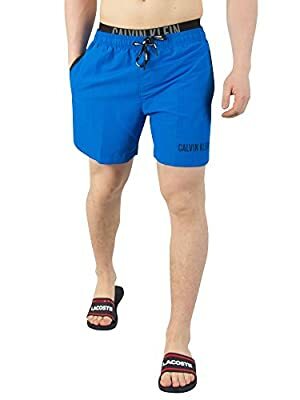 With open side pockets and a velcro back pocket, these swim shorts sport an elasticated drawstring waistband and a mesh lining. Calvin Klein Blue Double Waistband Swim Shorts. Brand New and Genuine. We are an authorised seller of Calvin Klein. See product description below for more information.